DUBLIN, Ohio , March 11, 2019 /PRNewswire/ -- It's time for The Big Dance ® , and Wendy's ® , the Official Hamburger of the NCAA ® , has big deals! The countdown to March Madness ® is ticking away, and basketball fans across the country are gearing up for the most exciting month of the year. Wendy's knows that being a fan can be tough – between filling out the perfect bracket to your team losing on a half-court buzzer beater. Whether your team wins or loses, Wendy's has your back all tournament long with great deals and prizes, including a chance to win a trip to the NCAA Men's Final Four ® in 2020. More likely, free food, but we dare you to take your shot and go for the grand prize! 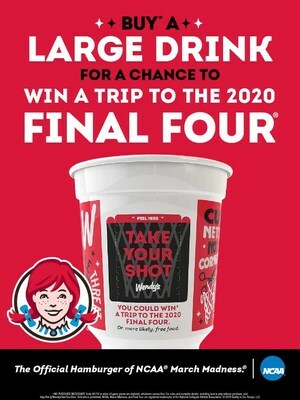 Starting today, March 11 , through April 7 *, Wendy's fans who purchase a cold, large drink will have a chance to win instant free food, $5 Wendy's mobile app credits for, you guessed it, more food, or a trip to Atlanta, Ga. , for the Final Four in 2020. The "Take Your Shot" promotion runs through April 7 *, so you'll want to get a couple of cold, large drinks as soon as possible to, you know, increase your odds. For Rules, free entry, possible earlier end date, prizes, odds, & full details, visit WendysTakeYourShot.com . "As the Official Hamburger of the NCAA for the third consecutive year, we're kicking it up a notch and offering fans more value than ever before," said Kurt Kane , Wendy's executive vice president, chief concept and marketing officer. "We encourage all fans to get in on March Madness and 'Take Your Shot'. With plenty of prizes and promotions, Wendy's is keeping fans fueled all tournament long." Plus, Wendy's is the exclusive Coca-Cola Freestyle launch partner for new Orange Vanilla Coke during March Madness. Orange Vanilla Coke and Orange Vanilla Coke Zero Sugar are the first flavor innovations added to the Coca-Cola® trademark in more than a decade, so swing by, fill up that large cup and give it a try. As the tournament progresses, Wendy's will continue to announce new mobile offers, so even if your team is eliminated, Wendy's will be right there to pick you back up. Download the Wendy's mobile app today and you won't miss one minute of the action. Wendy's ® was founded in 1969 by Dave Thomas in Columbus, Ohio . Dave built his business on the premise, "Quality is our Recipe ® ," which remains the guidepost of the Wendy's system. Wendy's is best known for its made-to-order square hamburgers, using fresh, never frozen beef*, freshly-prepared salads with hand-chopped lettuce, and other signature items like chili, baked potatoes and the Frosty ® dessert. The Wendy's Company (NASDAQ: WEN) is committed to doing the right thing and making a positive difference in the lives of others. This is most visible through the Company's support of the Dave Thomas Foundation for Adoption ® and its signature Wendy's Wonderful Kids ® program, which seeks to find every child in the North American foster care system a loving, forever home. Today, Wendy's and its franchisees employ hundreds of thousands of people across more than 6,700 restaurants worldwide with a vision of becoming the world's most thriving and beloved restaurant brand. For details on franchising, connect with us at www.wendys.com/franchising . Visit www.wendys.com and www.squaredealblog.com for more information and connect with us on Twitter and Instagram using @wendys, and on Facebook at www.facebook.com/wendys . The NCAA is a diverse association of more than 1,100-member colleges and universities that prioritize academics, well-being and fairness to create greater opportunities for nearly half a million student-athletes each year. The NCAA provides a pathway to higher education and beyond for student-athletes pursuing academic goals and competing in NCAA sports. More than 54,000 student-athletes experience the pinnacle of intercollegiate athletics by competing in NCAA championships each year. Visit ncaa.org and ncaa.com for more details about the Association and the corporate partnerships that support the NCAA and its student-athletes. *NO PURCHASE NECESSARY. OPEN TO LEGAL RESIDENTS OF 50 U.S. OR D.C., 13 YEARS OR OLDER. VOID WHERE PROHIBITED. Instant Win Game ends 4/7/19 or when all game pieces are depleted, whichever comes first. For Official Rules, prize descriptions, odds disclosures, and complete details, including how to play Instant Win Game without purchase, visit http://bit.ly/WendysTakeYourShot . Sponsor: The Coca Cola Company, One Coca-Cola Plaza , Atlanta, GA 30313.